-alphas (straight lines horizontally and vertically). 4. alpha, substitution-technique. 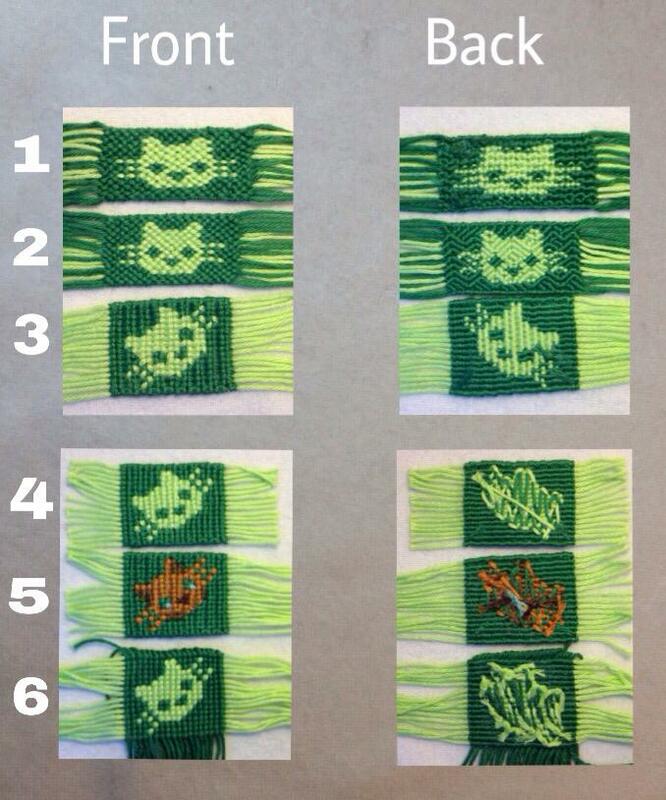 The second color is added while knotting. 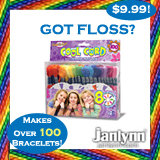 6 alpha, knotted like the fringe-bracelet , the knotting-string is not going back-and-forth. - Both normals and 1212-patterns can have the less easy FB- and BF-knots (bend arrows) . Strings change direction in these knots and at the same time the fabric becomes less tight with more of these knots. - 1212-patterns only have that kind of knots. The strings are always zigzagging from top to bottom. 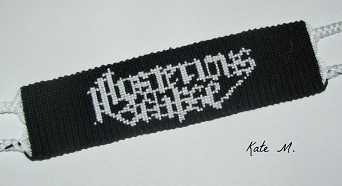 The image stretches out in the length of the bracelet. - Regular alphas never have these knots, which means that the strings only bend the other way at the end of a row. 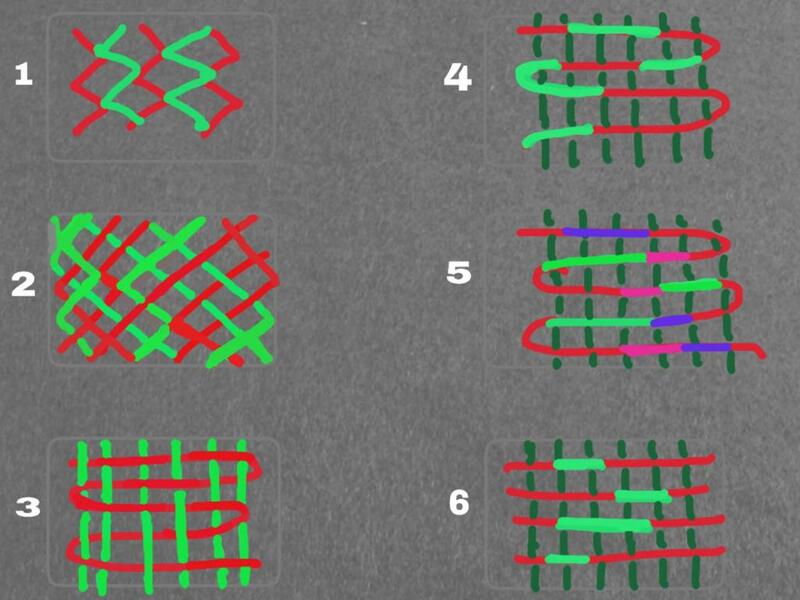 The knots in one row are always in the opposite direction of the knots in the previous and the next row. You can see that clearly in the top picture. In two-colored alphas it's even more visible; the knots appear a little stretched ( diagonally ) compared to an alpha which uses string-substitution. - The fringe-way of knotting an alpha-pattern is different: all knots are in the same direction, just like in normal bracelets. In fact, turned 45 degrees and without string-substitution, it is a normal pattern! 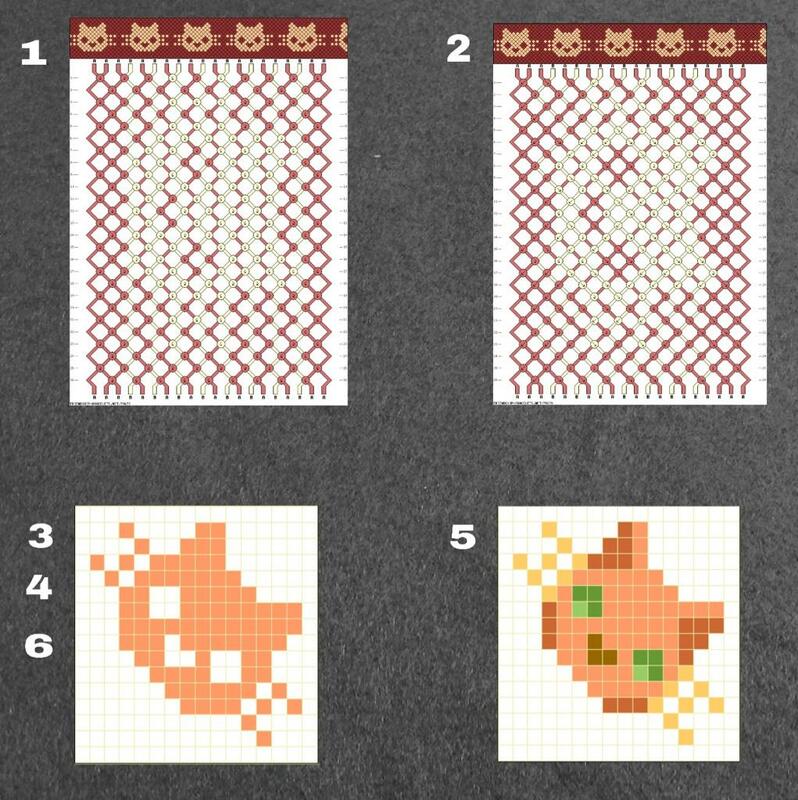 Have a look at #84363 where I made a normal pattern out of the square with the cat. 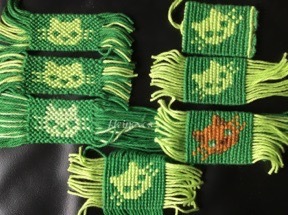 If you are a beginner I would recommend normals and two-colored-alphas, not 1212-style bracelets. The fringe-way is a very good alternative for the regular way of knotting an alpha I think, especially if you knot it like a two-colored alpha. The outcome is very neat due to the direction of the knots. It looks like a normal bracelet, you only have the fringe which can be glued to the back if you like. For those of you who still prefer 1212-style normals : they can easily be made out of every (two-colored) alpha pattern by turning the pattern 45 degrees. 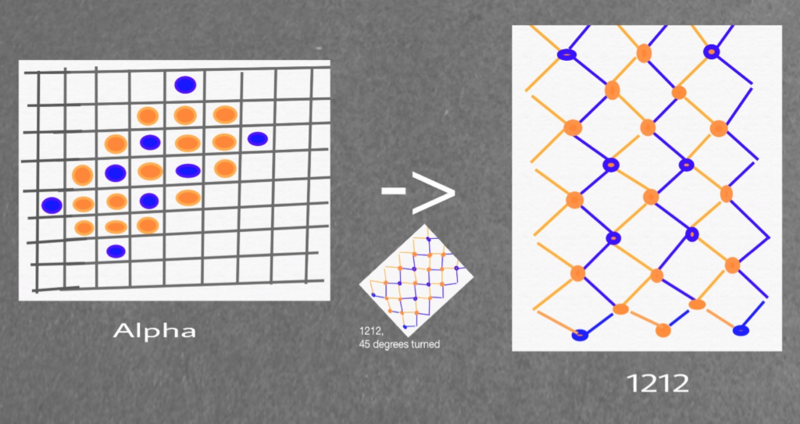 1212 means that you take one string color A( or color 1), one string color B(or color 2), one A, one B, and so on, till you have enough strings to make the pattern. Every knot can become color A or color B, because you're always knotting two strings with different colors together. The kind of knot , backward-forward or forward-backward, determines the color of the knot. 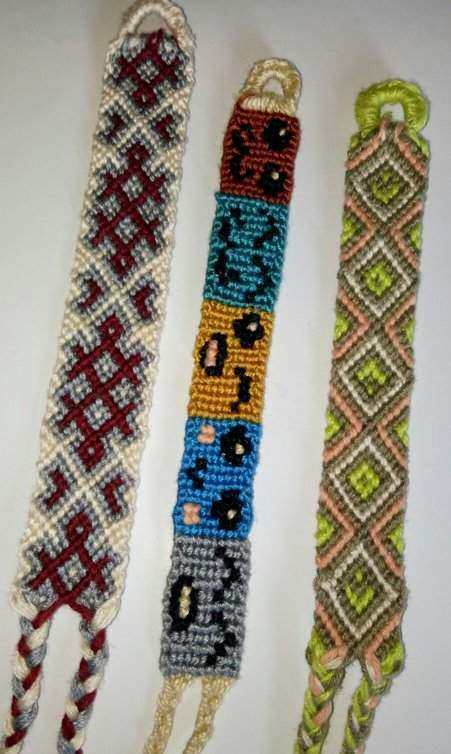 Therefore you only need a grid-pattern with diagonal lines ( instead of horizontal/vertical lines like an alpha-pattern) to make a 1212-style bracelet. The original author of this tutorial is kleinevos. The tutorial was last updated 4 years ago.